Attached to the Heritage Golf & Spa Resort hotel, the magnificent 18 hole "Golf du Ch�teau" golf course, which covers 100 hectares, is the masterpiece of South African golf architect Peter Matkovitch. Situated between the mountains and the sea in an undulating landscape interspersed with lakes, streams and tropical trees, this championship course (Par 72) is both technically challenging, varied and provides golfers with unique possibilities for a game with exceptional moments and memories. South African golf designer extrordinaire, Peter Matkovitch has integrated the two water courses that cross the golf course in the most beautiful way, creating small lakes which enhance the demands made on the technique of the players and yet fully respect the harmony and tranquillity of the place. Matkovitch has also integrated the magnificent Ch�teau of Bel Ombre and its gardens into the design at the heart of the golf course. 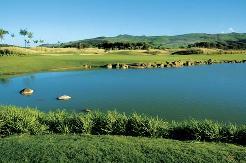 This course is certainly one of the most beautiful on the island with an amazing view over the lagoon to the south on one side and towards the hills of the Black River Gorges nature reserve on the other, giving players unique panoramic views at each hole. In addition, a mashie course has been created, a 9 hole par 3 course, ideal both for beginners as well as for more advanced golfers wanting to perfect their game. It is sited at the heart of the 18 hole course. Two qualified professionals are responsible for the operations of the golf course and can offer beginners lessons which can be videoed for extra learning potential. Finally, there is a restaurant as well as a bar, manned by courteous high quality staff to receive the players for a moment of well earned relaxation after a good game.